Currently available residences for sale can be viewed here. For a private tour of any available residence, please contact Lee or Connie. Both have recently facilitated in the sale and purchase of residences in this building. General Information: This Cincinnati condo gem is hidden in plain sight. The Kingston was designed and built in 1980 specifically as a condominium building. It isn't an apartment building that was later converted. Thoughtfully designed, it offers some of the nicest river valley views - as all of our clients have impressed upon us. Residents enjoy tremendous convenience to Downtown, Hyde Park and Mt Adams. If you work Downtown at say, the P&G corporate office, your commute could be as brief as 8 minutes- door to door! Here's the route. Imagine how inspirational the views would be with the 'drama of weather' providing a sunny day or dramatic sunset. In the past 5 years, residences with garage space have sold for between $225,000 and $547,000. For those specific condos, we've seen HOAs range between $800 and $1,310. Short video of the Kingston House from Kentucky. If you are considering selling your condo, you should know that we are part of a network of over 22,650 agents in over 980 offices in 72 countries. In fact, we are the fastest growing real estate company in the world! If there's a buyer for your home, we'll find them! 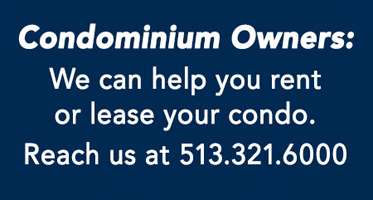 Whether buying, selling, or leasing a condominium in Cincinnati or Northern Kentucky, we will provide expert service. You can click on Lee or Connie's name to send them an email. The Living Room, with a spacious, open design - (including balcony walkout), is fantastic for entertaining. Imagine waking to the sun rising over the Ohio River! You'll find the most wonderful views - from inside your home, from the balcony, or from the patio!